Here’s a real mystery for you: a previously unknown letter written by J.R.R. Tolkien turns up in an unrelated book owned by a family unrelated to the letter. Can YOU solve the mystery? From NewsToday: A “MYSTERIOUS” letter written by JRR Tolkien has sold at auction for over £1,500 – after dropping out of a book. 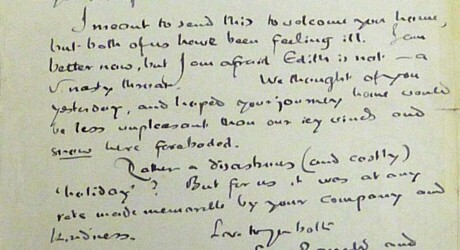 The hand-written note – addressed to a couple Tolkien had met on a particularly disastrous holiday with his wife – sold on Thursday for £1,700 to an unnamed internet bidder at Richard Winterton auctioneers, in Lichfield, Staffs. But as the seller’s family had no apparent links to the world famous ‘Lord of the Rings’ author, mystery surrounds the origins of the revealing letter.